After successful careers in journalism, Rockford-area natives Jim Killam and Lincoln Brunner are pioneering a unique reporting service, to tell the world about Christian missions. Learn how their work is changing the world(view). 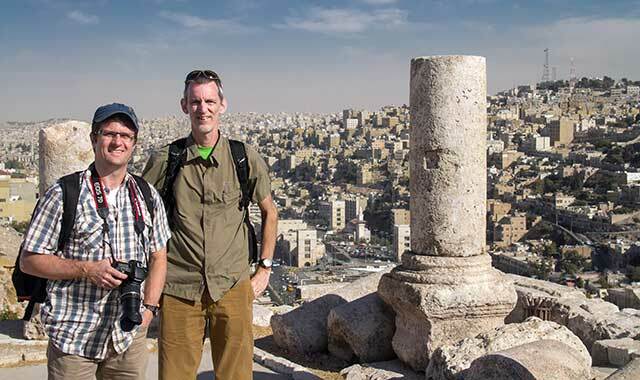 Journalists Lincoln Brunner (left) and Jim Killam pause atop the ancient Roman citadel in Amman, Jordan, during their reporting trip in October 2013. Editor’s Note: Jim Killam is a freelance writer for Northwest Quarterly Magazine and worked at NIU for 17 years as journalism adviser for student publications. We’re fascinated by his most recent chapter in life, and invited him to provide a glimpse of it with our readers. Last October, in a refugee camp outside Amman, Jordan, a Syrian man named Sader saw me taking photos and invited me into his family’s tent. His wife, Foza, sat on the ground, tending to her son who lay on a cushion beside her. Suffering from cerebral palsy and still exhausted from the family’s journey here three months earlier, the boy was too weak to sit up. Eighteen months had passed since the family fled their home near Hama, Syria, as bombs and tanks destroyed their neighborhood. For more than a year, they and a few of their neighbors bounced around Syria, finding shelter and relative safety where they could. Finally they decided they had no choice but to escape across the Jordanian border. Their eldest son, who also had cerebral palsy, died of exhaustion during the journey. Those moments with that family emblemize for me why I do what I do as a missionary journalist. Jordan’s Syrian refugee crisis prompted my colleague, Lincoln Brunner, and me to go there and report what’s happening in the shadow of a civil war that has killed more than 100,000 people. With every Syrian person we met came two common denominators: They all had lived through something awful, and they all wanted to tell us their stories. We visited a half-dozen Syrian refugee families that week, repeatedly finding ourselves inside tents or impossibly small apartments, sitting on foam mats that represented all the furniture those families had. They served us sweet Arabian tea. Through interpreters, they spoke of their hope of going home, the harshness of life as refugees and the compassion shown to them by Christians in Jordan, a country that’s 97 percent Sunni Muslim. That’s a story worth telling. All of this remains relatively new to me, after a career change in 2012. After 27 years working in newspapers and training college students for journalism careers, I gave in to the persistent restlessness that I now know was God’s calling. I left a great job, my wife and I sold our house and embarked on a journey that people might consider crazy: join a missions agency, raise our own financial support and help pioneer the field of missionary journalism. We still live in the Rockford area and I work with ReachGlobal, which is affiliated with the Evangelical Free Church of America. The 2013 Middle East trip capped a year of training journalism students in Costa Rica and reporting on crisis response efforts from Hurricane Sandy on the East Coast to epic flooding in Colorado. Lincoln and I wrote a book and laid more groundwork, forging relationships with churches and individuals around the world who want to invest in this unique work. This year, we are launching Crossfield News (www.crossfieldnews.com), an interdenominational news site that we hope helps to engage audiences in what God is doing globally. We think it will be an ever-growing network of local sites, both in the United States and around the world. To that end, we’re establishing a worldwide training network to help people tell those stories to audiences, both local and worldwide. Some of those people may be career journalists or journalism students. Others may be missionaries who understand the power of great reporting. In a way, this whole thing started because, as a kid, I used to count the bald guys in church. The occasion was Missions Sunday: the day the church’s supported missionaries paraded into the sanctuary with flags of their various countries. The day when it was OK for middle-aged Scandinavians to wear African robes in public. And, the day of long, droning stories about missionary life in some far-flung country where people used wildebeest dung as money. At least that was my perception. These foreign missionaries were good people doing great things, serving God in hard places, sometimes putting their lives in danger to do so. But they couldn’t show or tell an interesting story to save their lives. Sometimes they relied on slide shows with 100 bad photos of people posing for the camera. Great things indeed may have happened on those trips. But people didn’t get that from presentations filled with churchy clichés and generalities. The story wasn’t the people who went, but those they served: people with real names and real challenges who have experienced real transformation. Meanwhile, people in the pews responded with suppressed yawns or, worse yet, with raised eyebrows, doing the math on how much money this cost vs. the perceived return on investment. Like many, I still glaze over during those interminable slideshows. Many times I’ve thought: If people inside the church are uninspired by all of this, how will it ever connect anyone outside? God has a fantastic sense of irony, though. Today, I get to be part of a movement to tell people what’s happening on the mission field and why they should care. We do it with a sense of urgency. Too many people have been too bored for too long. It all seemed like some apocalyptic action movie. Society in chaos. Machine-gun-toting bad guys driving a ragtag collection of stolen trucks across the Central African savanna. Chasing … what? A convoy of missionaries headed for the border? That’s what played out on Palm Sunday in the Central African Republic, following an overthrow of the government. The missionaries knew they didn’t have much time to escape to neighboring Cameroon. Only later would they learn just how close they’d come to not making it. That’s the opening of a 2013 story that I promise will not leave you counting bald heads. I wasn’t present during that situation, but I heard the story firsthand from people who were. That’s the beauty of covering missions, even if we can’t always get to a scene: We know people working absolutely everywhere, and most of them have Skype. If you’re older than about 35, you’ll remember a series of TV ads in the 1990s where actress Sally Struthers narrated heart-wrenching images of starving children, in a plea for viewers to sponsor those kids. If you’re under 35, you’ve seen singer Sarah McLachlan do basically the same commercial, but with sad kittens. The ads, and many others like them, follow a tried-and-true formula: Stir up the audience emotionally, and just when that reaches a fever pitch, hit them with the financial pitch. Just pennies a day can feed and clothe an African child, or rescue Fluffy. Won’t you help? For decades, some form of this approach has been part of the fundraising mix for the nonprofit world, including Christian missions. People need a compelling reason to give, and emotions play a strong role in those decisions. I’m not saying that’s always wrong. Great good has been done through emotionally charged giving campaigns. When the subject is a ministry, though, this approach alone can deny people the chance to thoughtfully and prayerfully assess a situation before either writing a check or looking away. That, by itself, is not the best way to form long-term, informed ministry partnerships. I believe good journalism is the missing piece. We are not the sales and marketing arm of ministry. Journalism takes a risk: Conveying accurate information through compelling stories and leaving you, the reader or viewer, to decide what to do with it. Which, in turn, engages people in the work of God. Alerting the world to what’s happening in places like Jordan or the Central African Republic, or even Staten Island, N.Y., increases the likelihood that people will pray, give money or even go there to serve. No celebrity help needed. It happened last fall as I enjoyed breakfast on the roof of a concrete church building in Mafraq, Jordan, with relief workers from all over the world. It certainly happened two summers ago in Poland as I found myself on a pirate ship, sailing to the edge of the Baltic Sea, accompanied by a bunch of people from Nebraska (that’s a story for another day). I’m sure I’ll ask it again this spring as we report from Egypt about the incredible courage of persecuted Christians there. The only response I can offer is that God uses unlikely people to accomplish his purposes. Always has. It’s not about being some sort of hero. It’s simply listening to his call to do something crazy, and saying yes. Do that, and you’re in for the adventure of your life. Look for Jim Killam’s work at jimkillam.com. Parts of this story are excerpted from the book, “Go Tell It: How and Why to Report God’s Stories in Words, Photos and Videos,” by Jim Killam and Lincoln Brunner (May 2014, Moody Publishers). 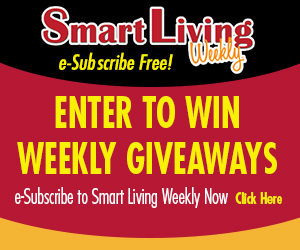 This entry was posted on Friday, February 14th, 2014 at 11:57 am	and is filed under Features, Top Posts. You can follow any responses to this entry through the RSS 2.0 feed. Both comments and pings are currently closed.